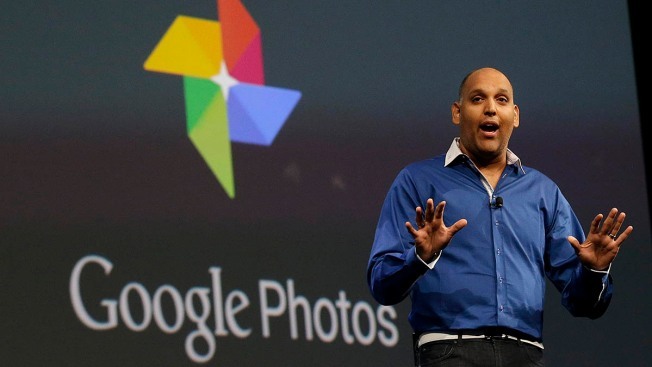 Anil Sabharwal, director of Google Photos, speaks during the Google I/O 2015 keynote presentation in San Francisco, Thursday, May 28, 2015. Google's new image-recognition program misfired badly this week by misidentifying two black people as gorillas, delivering a mortifying reminder that even the most intelligent machines still have lot to learn about human sensitivity. The blunder surfaced in a smartphone screen shot posted online Sunday by a New York man on his Twitter account, @jackyalcine. The images showed the recently released Google Photos app had sorted a picture of two black people into a category labeled as "gorillas." The accountholder used a profanity while expressing his dismay about the app likening his friend to an ape, a comparison widely regarded as a racial slur when applied to a black person. "We're appalled and genuinely sorry that this happened," Google spokeswoman Katie Watson said. "We are taking immediate action to prevent this type of result from appearing." A tweet to @jackyalcine requesting an interview hadn't received a response several hours after it was sent Thursday. Despite Google's apology, the gaffe threatens to cast the Internet company in an unflattering light at a time when it and its Silicon Valley peers have already been fending off accusations of discriminatory hiring practices. Those perceptions have been fed by the composition of most technology companies' workforces, which mostly consist of whites and Asians with a paltry few blacks and Hispanics sprinkled in. The mix-up also surfaced amid rising U.S. racial tensions that have been fueled by recent police killings of blacks and last month's murder of nine black churchgoers in Charleston, South Carolina. Google's error underscores the pitfalls of relying on machines to handle tedious tasks that people have typically handled in the past. In this case, the Google Photo app released in late May uses recognition software to analyze images in pictures to sort them into a variety of categories, including places, names, activities and animals. When the app came out, Google executives warned it probably wouldn't get everything right — a point that has now been hammered home. Besides mistaking humans for gorillas, the app also has been mocked for labeling some people as seals and some dogs as horses. "There is still clearly a lot of work to do with automatic image labeling," Watson conceded. Some commentators in social media, though, wondered if the flaws in Google's automatic-recognition software may have stemmed on its reliance on white and Asian engineers who might not be sensitive to labels that would offend black people. About 94 percent of Google's technology workers are white or Asian and just 1 percent is black, according to the company's latest diversity disclosures. Google isn't the only company still trying to work out the bugs in its image-recognition technology. Shortly after Yahoo's Flickr introduced an automated service for tagging photos in May, it fielded complaints about mistakenly identifying black people as "apes" and "animals." Flickr also mistakenly identified a Nazi concentration camp as a "jungle gym." Google reacted swiftly to the mess created by its machines, long before the media began writing about it. Less than two hours after @jackyalcine posted his outrage over the gorilla label, one of Google's top engineers had posted a response seeking access to his account to determine what went wrong. Yonatan Zunger, chief architect of Google's social products, later tweeted: "Sheesh. High on my list of bugs you never want to see happen. Shudder."